Researched Nutritionals Tri-Fortify™ Orange provides the preferred reduced L-glutathione, the major intracellular antioxidant essential for detoxification in the body, plus vitamin C, in an absorbable liposomal delivery system. The unique liposome structure allows it to combine effectively with the body's natural fluids and penetrate its protective membranes, bypassing the digestive system and directly entering the blood stream. By avoiding the process of digestion, nutrient absorption and utilization is much quicker and more complete. 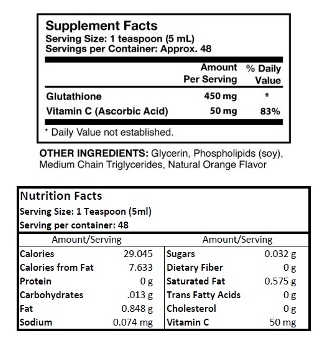 Researched Nutritionals contracted with an independent third party lab to subject Tri-Fortify™ Orange to the most extreme conditions: 104°F and 75% humidity for 90 consecutive days. The result: product met & exceeded the nutrient content on the label. Suggested Use: Adults should take 1 teaspoon daily in water or juice before breakfast. Additional doses may be taken before other meals as well. Caution: Pregnant women and children under 12 consult a health care professional before use. Glycerin, phospholipids (soy), medium chain triglycerides, natural orange flavor. Seems to help me take abx better with less herx.